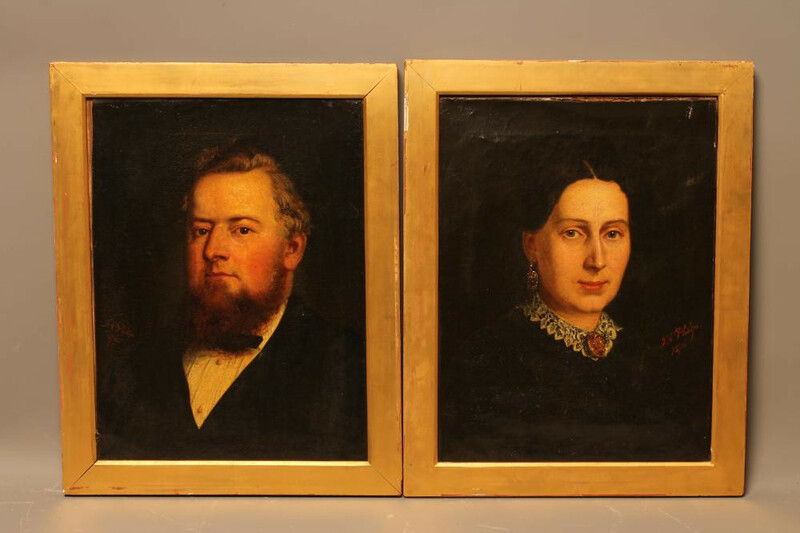 A friend of the society recently bought the pictures below (anonymous 1876 portraits in oils by an F A Philips) and decided to research the family. They are believed to be of a Dewsbury wine and spirit merchant and his wife: Francis Morris Fearnside and his wife Elizabeth.
. In 1959 living at Collerest, 146 Francis Morris Fearnside b 5th July 1835. Of Dewsbury. Son of James Fearnside, engineer. bap 7 Jul 1836. d 17 March 1896. Wine and Spirits merchant Messrs Fearnside. Stood for Dewsbury Town Council 1880 & 1882. Freemason, St John’s Lodge. marr 14 April 1864 , Mirfield Elizabeth Thornton b 1835 dau of Peter Thornton, Mirfield boat builder. d 2nd Jun 1886 , Lunatic Asylum, Wye House Asylum, Fairfield, Buxton ‘an establishment for the care and treatment of the insane of the higher an middle classes’ aged 51. Frank Morris b c1868. Bap 12 Apr 1868. d 6 Jan 1922 aged 54. Wine and spirit merchant. Dewsbury Cllr, Feb 1908-Mar 1910, Conservative. Freemason, St John’s Lodge marr. Mary Eliza Winterbottom (b Dewsbury c1869) 1890. In infant. Died in infancy. Hilda b c1903. marr 27 July 1933 Edmund Jessop Hoyle b 1898 of Headfield Road, Dewsbury, eldest son of Robert Cecil Hoyle, engraver. In 1959 living at Collerest, 146 Huddersfield Road, Brighouse. He died suddenley at HRI 6 Jan 1959 aged 60. James Thornton b Q2 1875 Of 7 Northfield Place, Dewsbury, d 16 April 1935, Dewsbury, aged 60. John Arthur, Captain, MC MRCVS RAVC b Q1 1880. Veterinary student Edinburgh, 1901 census. Hotel keeper at death. Died Ballachulish Hotel, Ballachulish 25 Feb 1931. Marr Elizabeth (Fenny) Lindsay Cromb Fenwick. Hotel keeper at death. Died Ballachulish Hotel, Ballachulish 18 Feb 1931. Elizabeth (Betty) Fenwick, marr John Hutton Shields son of late John Shields of Glasgow on 14 Nov 1933 at St John’s Episcopal Church, Ballachulish In 1941 he was Captain of Argyle and Sutherland Highlanders. In 1947 Major. D 1965. He was for many years district manager with David MacBrayne Ltd. at Fort William. Latterly he was transport manager at the company's Glasgow headquarters. She was the proprietor of the hotel until at least 1950.
a son b. 28 Jan 1939. Family tree compiled from the above research. If you have an interest in this family please leave a comment below. I have mentioned your interest to a couple of people who may have a Walker connection. Is on here would like to know more about family please he is my great grandfather,s brother john Edward Walker .